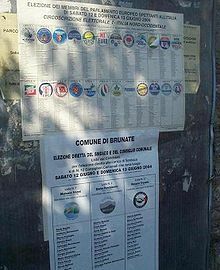 Tabella electionis pro Parlamento Europaeo in Italia anno 2004 indices factionum politicarum ostendit. Factio politica vel sola factio est societas civilis quae pondus politicum intra gubernationem vel administratio digestanem adfectat, plerumque in certaminibus electoralibus certando. Factiones, nonnunquam consociationes inter res diversas, ideologiam adfirmatam saepe sustinent, vel sententiam a proposito ad fines disertos scripto fultam. Dux factionis saepe "praeses", interdum "secretarius generalis", interdum aliis titulis nuncupatur. Abizadeh, Arash. 2005. "Normative Foundations of National Baha'i Elections." World Order 37(1):7–49. "Democratic Elections without Campaigns? Duverger, Maurice. 1954. Political Parties. Londinii: Methuen. Gunther, Richard, et Larry Diamond. 2003. "Species of Political Parties: A New Typology." Party Politics 9(2):167–199. Neumann, Sigmund, ed. 1956. Modern Political Parties.. University of Chicago Press. Smith, Steven S. 2007. Party Influence in Congress. Cantabrigiae: Cambridge University Press. Sutherland, Keith. 2004. The Party's Over. Imprint Academic. ISBN 0-907845-51-7. Vicimedia Communia plura habent quae ad factiones politicas spectant. Novissima mutatio die 27 Ianuarii 2018 hora 17:26 facta.